According to the National Association of Realtors, existing-home sales increased 3.3 percentage points to a seasonally adjusted annual rate (SAAR) of 5.69 million. NAR Chief Economist Lawrence Yun says January's numbers show the resilience of buyers. 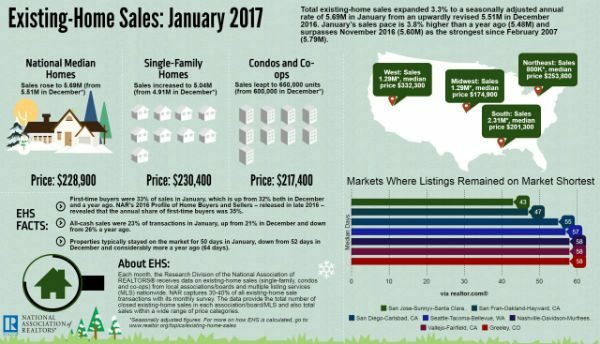 The first month of 2017 sets the year up for a red-hot start after what National Association of Realtors Chief Economist Lawrence Yun called a “soft” December. In January, NAR’s existing-home sales spiked 3.3 percentage points to a seasonally adjusted annual rate (SAAR) of 5.69 million — up from an upwardly revised 5.51 million in December. This month’s sales pace is 3.8 percentage points above January 2015 and is the fastest SAAR sales pace in nearly a decade. The Northeast, South and West experienced strong growth, while the Midwest took a small hit. Distressed sales were unchanged at 7 percent, which is still lower than a year ago. The median existing-home price for all housing types in January rose 7.1 percentage points to $228,900, which marks the 59th consecutive month of year-over-year gains. Total housing inventory experienced a boost as well, with a 2.4 percentage point jump to 1.69 million homes for sale — a much-needed jump from the rock bottom levels seen in December 2016. Despite the strong numbers, inventory is still 7.1 percentage points below January 2016 and is the 20th consecutive month of year-over-year declines. Unsold inventory is at an unchanged 3.6-month supply. NAR Chief Economist Lawrence Yun says January’s existing-home sales show the resilience among consumers in the face of rising mortgage interest rates. “Much of the country saw robust sales activity last month as strong hiring and improved consumer confidence at the end of last year appear to have sparked considerable interest in buying a home,” he said. Distressed sales, which include foreclosures and short sales, were at 7 percent — unchanged from December and a 9 percentage point drop from January 2016. Five percent of January sales were foreclosures, and 2 percent were short sales. Single-family home sales were at a SAAR of 5.04 million — a 2.6 percentage point month-over-month increase and a 3.7 percentage point year-over-year increase. The sales price for single-family homes increased by 7.3 percentage points to $230,400. Existing condominium and co-op sales rose 8.3 percentage points to a SAAR of 650,000 units, 4.8 percentage points higher than a year ago. The median existing condo price was $217,400 in January — up 6.2 percentage points from 2016. In the Northeast, existing-home sales jumped 5.3 percent to an annual rate of 800,000, up 6.7 percent from a year ago. Median price: $253,800, a 2.5 percent year-over-year decrease. In the Midwest, existing-home sales decreased 1.5 percent to an annual rate of 1.29 million. Median price: $174,900, a 6.5 percent year-over-year increase. In the South, existing-home sales rose 3.6 percent to an annual rate of 2.31 million. Median price: $201,400, a 9.2 percent year-over-year increase. In the West, existing-home sales ascended 6.6 percent to an annual rate of 1.29 million. Median price: $332,300, an 6.8 percent year-over-year increase.